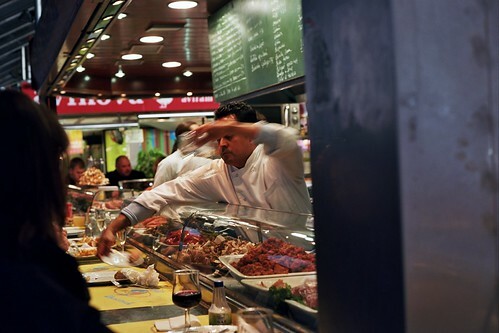 Heading to Barcelona, I was obsessed with the Boqueria marketplace. 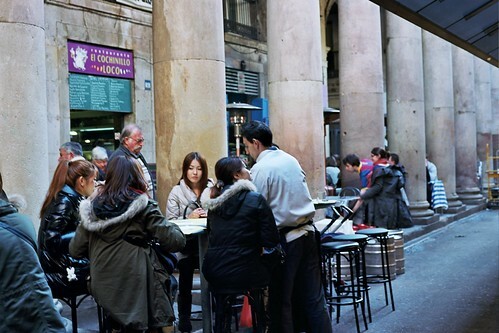 I wanted to photograph it and sample all the different foods there, gorging myself on slice after slice of jamon and who knows what else. Once we got there, though, I ended up mostly window shopping, ogling the wares and wondering how one cooks a cockscomb. On the one ‘morning’ we did eat there (and by morning, I mean afternoon), we went to Kiosko Universal. Since it wasn’t actually morning, we skipped the customary cava and went straight to the red wine. 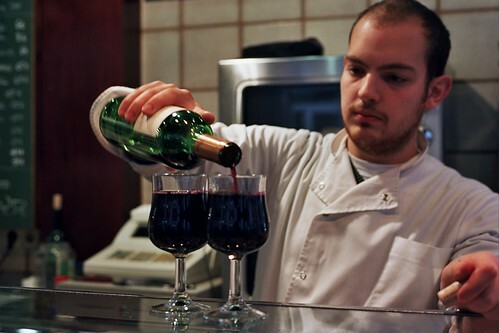 We sat at the counter sipping the wine as the workers bounced around prepping food and pouring drinks. 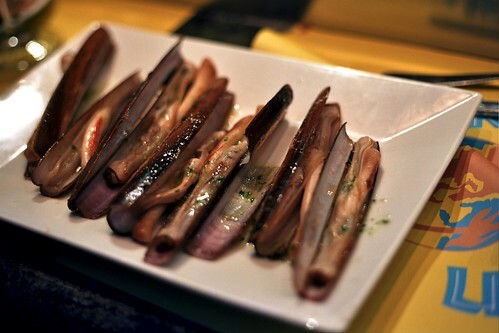 We started off with razor clams sauteed in garlic. They’re odd looking, but delicious. I’ve seen them in Chinatown before, I definitely want to try cooking them at some point. 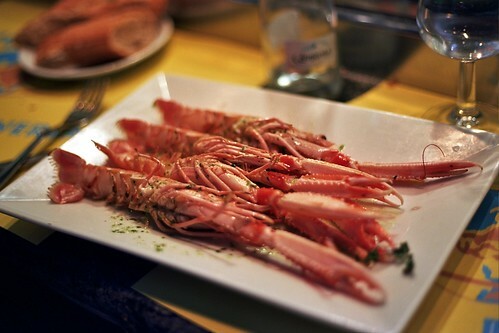 We followed that up with an order of escamarlas – I had no idea what they were called, I just pointed. I still don’t know what we’d call these in English. Prawns? Whatever they’re called, I was all over them. Tammi demurred, she’s not so into the hands on shelling necessary to get to the meat in something like this. The flesh was also cooked much less than Americans are used to. 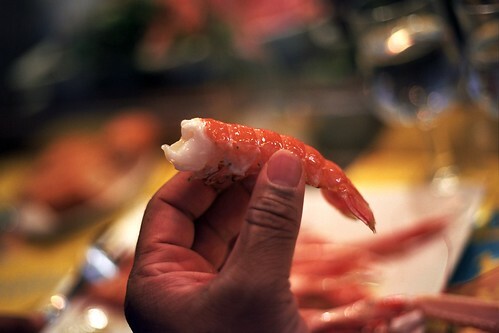 It wasn’t rare, exactly, but it was much less firm than any shrimp-like foods I’ve ever had. Digging for every nugget of meat in the crevices of each of them was pretty messy and deeply satisfying. We were trying to save our euros, so we stuck with that, but there were many other dishes behind the counter that caught my attention. I’ll just have to pend more time perusing the menu next time I’m in town.